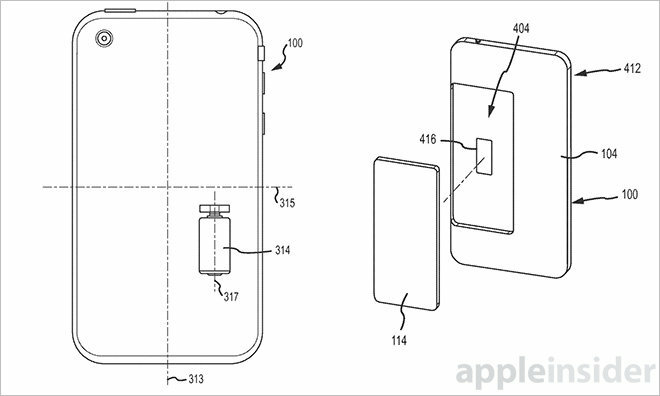 A new Apple patent published by the U.S. Patent and Trademark Office (USPTO) titled “Protective mechanism for an electronic device”, details a futuristic iPhone protection system that can recognize when a phone is dropped, calculate an estimated point of impact and shift its center of gravity in midair to avoid striking sensitive components, AppleInsider is reporting. Apple’s invention can not only predict where an iPhone will make impact, but also actively shift the unit’s center of gravity so that sensitive components like glass screens and cameras are not damaged. Apple notes that the system relies on sensors to monitor physical device activity and positioning, leveraging onboard accelerometers, gyroscopes and GPS, with more advanced designs calling for ultrasonic sensors. “Feeding the data generated by the positioning sensors to a central processing unit enables quick and accurate device positioning determination, specifically as it applies to a state of freefall. Once calculations are complete, the system activates a protective mechanism designed to reposition the device in midair so as to impart the least amount of damage to fragile components. The main example uses a motor with eccentric mass able to impart a force on a falling phone’s rotational axis, causing it to land on a preferred site, such as its side or back”. The source points out that both iPhone 6 and 6 Plus incorporate :bespoke linear oscillating motors: that do not use an eccentrically connected rotational mass but previous models did, which means that the patent could easily be applied to an upcoming iPhone model.